Decorations set the tone for the entire party. Pool parties can be loads of fun, and setting the tone with the right overall theme is the first step in making yours a success. A pool party is a great summer party idea. Add a theme and complete it with decorations, activities and food for a festive time. Even though the party is taking place at a swimming pool, you can recreate the feeling of a beach party with the right decorations. Include a sandbox for a kids party, along with plenty of pails and shovels to play with. 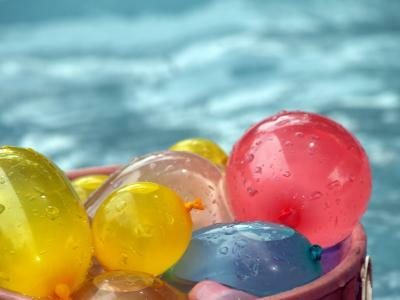 Beach balls can be decorative and also fun to play with in the pool. Large, colorful beach towels can be draped over chairs or fences, and large umbrellas provide both decoration and shade for sun-soaked guests. Motifs like seashells can be used on everything from paper plates and napkins to strings of lights around the pool or fencing. Food can be kept simple, much like what you would eat at the beach. You can serve pizza, chips, soda and ice cream. Keep your guests entertained with plenty of music and a game of volleyball. If you have a sandbox, let the kids build a sandcastle. Make your guests feel like they're deep below the ocean with an under the sea theme. Hang paper streamers in shades of blue and green vertically along fences, creating a sense of both flowing water and seaweed. Paper fish can be attached randomly on the streamers. Place inflatable or plastic fish, seahorses, dolphins, and other sea creatures on tables, around the pool, and even floating in the pool. A menu to compliment this theme can be filled with a cake done in the shape of a fish, fish and chips, Goldfish crackers and a blue punch. Pin the Tail on the Whale: Use a large whale that you either draw or print out and cut off the tail. Make several copies of the tail to use with this game. Blindfold the guests one by one, spin each around, and have them try to pin the tail on the whale. Beanbag Toss: Place small prizes in beach pails and give guests the chance the throw beanbags into the pails for a chance to win the prize. A Hawaiian luau theme is simple to work into any outdoor party. 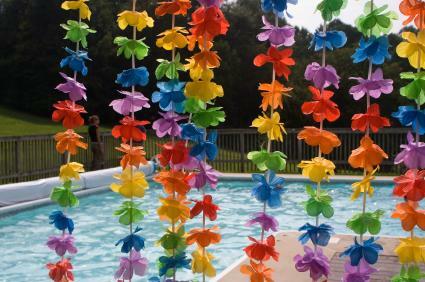 Bright colors, large fresh or paper flowers, leis, and grass skirts are all easy-to-find decorations that can be incorporated into the pool setting. Grass skirts can be hung around tables and on fences, and brightly colored flowers can be placed almost anywhere to create a festive mood. If you're feeling ambitious, create tropical palm trees out of fence posts by wrapping the posts in brown streamers. Attach green leaves cut from construction paper, and finish the "trees" off with a couple of brown balloons for coconuts. For a special touch, float fresh orchids in the pool water or purchase floating candles to use. Pineapple Bowling: Set up pineapples as bowling pins and use a coconut instead of a bowling ball to try and knock them down. Pass the Coconut: This is played like Hot Potato. A coconut is passed around a circle of guests. Play music; when it stops, whoever is holding the coconut is out. Sand Bucket Toss: Use a sand shovel to dig ping pong balls out from the sand and toss them into a bucket set five feet away. The person who fills their bucket up first is the winner. Use rubber ducks as decorations as well as favors for this fun pool party theme. 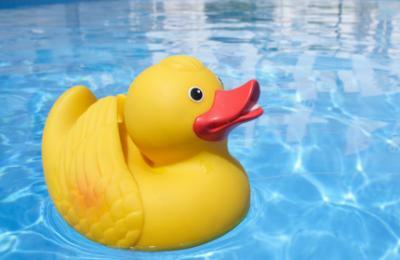 You can hold a rubber duck race in the pool as the main event of the party. Decorate with rubber ducks and a bunch of balloons and streamers done in bright yellow. Rubber ducks come in all shapes and sizes so include a fun mix to delight your guests. You can serve yellow food such as cheese, crackers, lemon pie and drinks such as lemonade. For a fun twist, purchase duck shaped cookie cutters and make duck cookies or sandwiches cut in the shape of ducks. Chairs can also be set up around the pool for those who prefer to watch the movie out of the water. Hang a piñata to entertain your guests. It can be filled with candy and various pool novelty items such as deflated beach balls, sunglasses and water guns. Play salsa music and let your guests dance the night away. A poolside picnic is the perfect way to celebrate summer. It is simple to do and can be done with decorations such as red and white plaid table cloths, blankets on the ground and plenty of red and white beach towels. You will also need a grill. Play games such as volleyball in the pool or relax poolside while sipping on a refreshing lemonade. Turn your pool area into a tiki lounge for your next party. You can set up an outdoor bar and use grass skirting around it to create your own tiki bar. Tiki torches can be displayed around the pool area as well as strings of lights. You can play a game of limbo in the pool and have reggae music on in the background to complete the mood. For items like these and more, check sites such as In the Swim or AmeriMerc online, or visit your nearest pool supply store. Whatever party theme you choose for a swimming party, be sure to carry out throughout the party. From food to decorations, a theme can add an element of fun to any celebration and set the tone for the day. Use caution with decorations and activities played around a pool. The most important thing to keep in mind is safety of your guests.